The warped remains of the once great Celestial Capital of the Zilart, Al'Taieu is secluded to all but the most skilled of adventurers seeking fame, fortune, and challenge. Even to this day, after 10,000 years since it became isolated from the rest of Vana'diel, bizarre creatures, such as the sky-borne Yovra and marine Phuabo, still dwell in this surreal area and serve as guardians to the Grand Palace. This area is said to yield some of the most powerful of monsters, even the mighty Aern, Absolute Virtue. 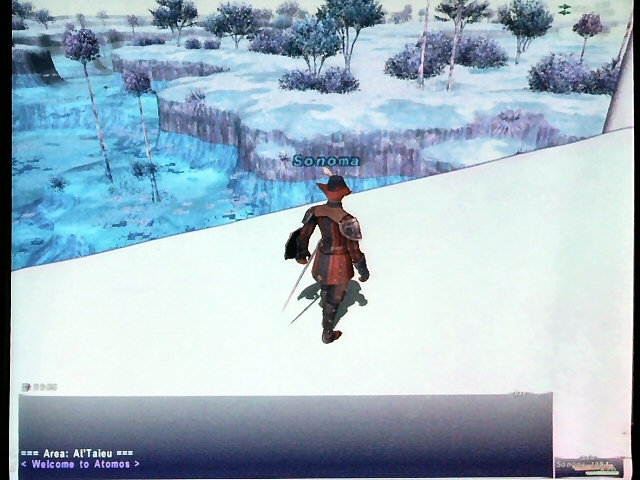 More commonly grouped with the Grand Palace of Hu'Xzoi and The Garden of Ru'Hmet under the player name of "Sea". All mobs in Al'Taieu that will aggro a player are true sight or true sound, making Sneak and Invisible effects useless. Dimensional Portals in Konschtat Highlands, La Theine Plateau, and Tahrongi Canyon, as well as the special airship in Sealion's Den allow for transportation to Al'Taieu. The Map of Al'Taieu can be obtained by completing a mini-quest requiring you to visit each Quasilumin in Al'Taieu. This page last modified 2009-09-02 15:43:15. Would a lv 16 war be able to get here? Even if I neva beat CoP and if I use a choco? What, so you can solo AV? You don't necessarily have to beat CoP to be able to get there. You just need to have defeated Tenzen, or CoP 7-5, to enter Al'Taieu.. sea. God Fights Similar to "Sky"
Anyone have any news or rumors of accessing fights with "Sea" Gods similar to that of Kirin and his underlings? I am under the impression that this would be the case. As of now, unfortunately, there is no evidence to back this assumption. yeah check this God out! It will be interesting as to where they will put these new HNM's. There really isn't much space in either of the exiting maps now (Grand Palace of Hu'xzoi and Garden of Ru'hmet). I'm getting it's the lower floor of The Garden of Ru'hmet.. since the elevator gives you the option of doing down, but doesn't actually work. I hope that make it so that you can go down withoug having to "run the gauntlet" of the 4 Zdei's. It's speculation that HNM's like that will be added later. What is not shown on this map is that you only have partial access here. There is a barrier across (pretty much all of) E9 and H11. The farthest north you can get to is to the Updrafts. From the map, it appears that there are 2 more towers to the far north, but as of Jun'05, they are inaccessible. I appears that someone has hacked their way into the northern area on this map. It seems that the northern area hasn't really been enabled. i.e. there are no mobs there. But they did find a bunch of things there. ..it reminds me of Macalania in FFX. *** another spoiler of sorts. oh... this is the place that the Duchy of Jeuno is ultimately trying to get to, and is why you have to go to the Celestial Nexus the last Zilart mission to defeat them. Al'taeiu is the place where the Zilartian King resides in the Grand Palace of Hux'Zoi. In the storyline this also where the keeper of the apocalypse is currently residing. Only thing is whether or not it is the realm of the celestial gods is up for debate. When you get there Nag'lomada exclaims that this is the area pass the gate of gods, but Ulmia and other NPCs will reveal that it may not be but the precurser to the relam of Gods. When you enter Grand Palace Hux'Zoi you find a door called the Gate of the Gods. That is as far as anyone in the game can progress until the end of april. The storyline is filled with a lot of plot twists after Sacraium and more importantly Promyvion-Vhazl. Allies become enemies and Enemies become Allies and etc. thats about as much as i want to spoil. That which exists in creation without my knowledge, exists without my consent. Does anyone know the name of this area's music file? I'd love to hear it's music but i doubt i'll ever get to go there. its music file 233. It's a rather tranquil tune. This post is provided as is. All spelling mistakes and inaccuracies may or may not get corrected, however all shinies can and will be confiscated. =^.^= ~nyo! what program do you use to play the files with? So, what's going on down there? Has anyone found out any new info about this place storyline-wise? Got access last night. Good Music. Interesting mob agro. I can't remember names since they have really odd names. One mob would agro, come to you, look at you and changes their pose and then swims away lol. It's a sea alright. Your basically walking on the water. Occasionally there are mobs that swim in the water, most are above the water it seems. To a lvl75, mobs were Easy Prey to Tough from what I saw. I will be going back tonight to try to get a map, gain access to more areas thus progressing in PM's. you get here after completing PM7-5 in which you fight Tenzen in a BC in Sealion's Den. You get teleported automatically i believe. You also get a Light of Al'taieu. If nobody has been here, how did they get a map on here? Or does that auto-collect program find the pictures for maps too? Square-enix recently revealed this area at an Intel presentation of their new Centrino chip. It was a demo of sorts to show off the Centrino. The only information from SEI is that the area will be rolled out soon and represents the climax of the Promathia missions. The theory runs so far that The Garden of Ru'Hmet and the Grand Palace of Hu'Xzoi are related to it, but there is nothing solid to back this up. So does anyone really know how to get into Al`Taieu? Truthfully I feel you have to finish the chapters they give in �chains of promathia�. I think this is the only true way to gain access to �Al'Taieu�. after Februarys update of course, when they add new chapters I strongly feel this is going to be one of the new areas one can access to do the new chapters. No, the item to gain access to sky is called the 'Cerulean Crystal' moon pass is what lets you get pass the moongates in Ro'Maeve for the 70+ leveling area. Calling it sky makes perfect sense, its in the sky, there we go? Pictures some one give me pictures of this place >.< driving me crazy wanting to know what the scenery is like. You see a glimpse of it in the first chapter with the mysterious youth in the hospital in Upper Jeuno. Mark my words, the very moment I'm doing a Promathia mission and some jerk in my party says "I just want my sky 2 pass," I do /shutdown and never play the game again. I've always thought calling Tu'Lia "sky" sounded dumb, but "sky 2?" Isn't this place underwater? Could we possibly call it "sea" or something? It's gonna be so sad once people are only doing these missions for material rewards and such. Lol I hate calling it "sky" too. It's Tu'Lia, not that much harder to type. Well the entire region floats about the clouds, so calling it "sky" does make sense, which is why the Japanese refer to it as "sora." But I see your point, just too bad autotranslating <Ru'Aun Gardens> <Area> is so cumbersom. I think it will be for the Kuluu and the Promathia expansion what Sky and Tulia were for the Zilart. Loony? Perhaps. Spoony? Most Definitaruly. BRD75 - SMN75 - BLM(25). five arrows, five crags, (Delkfutts, and Fei'Yin). I remember SE saying something about Inflatable Rafts in CoP.